There are several scenarios where a floating licenses can make it more cost-effective to use NCover. Some users have clusters of build servers that build and test code centrally. Others have fleets of virtual machines that run various scripted integration tests. Sometimes, in order to test multiple configurations, there are many more virtual machines on-line than are actually used at any one time. Other teams use NCover as a periodic checkup tool, rather than on a daily basis. NCover has a floating license feature that allows you to purchase multiple NCover licenses and store them centrally on your Code Central server. When an NCover Desktop or Collector starts up, it checks out a floating license from the server. When it's finished and ready to shut down, NCover checks the license back into the Code Central server so that another copy of NCover can be activated in another location. In effect, the NCover licenses can "float" between computers on the network. Floating licenses are different from the standard NCover licenses that you can purchase online. Please contact our sales team to ask about floating licenses and we'll be happy to give you a quote. Floating licenses are packaged along with a Code Central server license. So the first step is to activate your Code Central with a license pack that contains floating licenses. Our sales or support staff can help you get what you need to do that. After activation, you'll see on the Code Central Admin page (click on the NCover ball in the top left of the page and select the Admin menu option) the number of licenses that are available on the server. In this case zero of five floating collector licenses have been used and zero of ten floating desktop licenses have been used. After checking out a floating license, you can come back to this page and see which licenses are checked out and which machine they are currently on. You can also release licenses from this page if you desire. When NCover is started for the first time, you'll see the licensing screen. 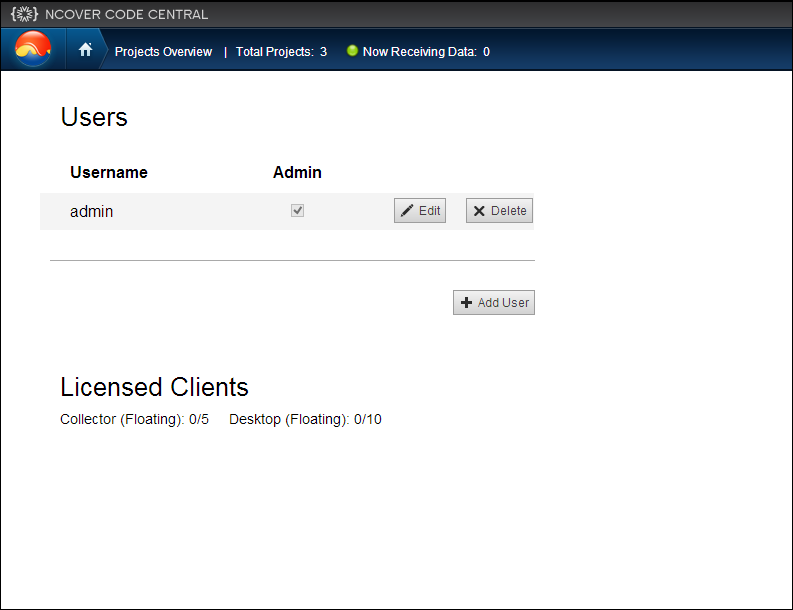 Select the option to connect to Code Central and login with your Code Central credentials. 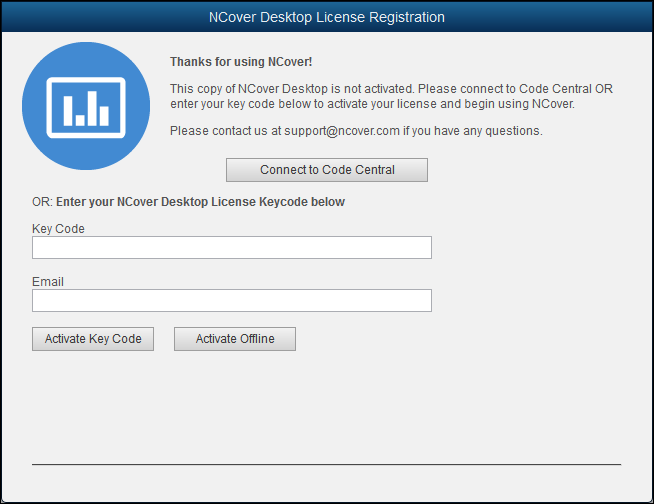 When you supply your Code Central login, your copy of NCover will reserve a license if one is available at that time. After your copy of NCover gets its license, you can go the License Details menu (on the NCover logo menu on the top left of the page) to see that it's a floating license. If you are finished using this copy of NCover and wish to return the license back to the server so it can be reused just select the "Release Floating License" button. 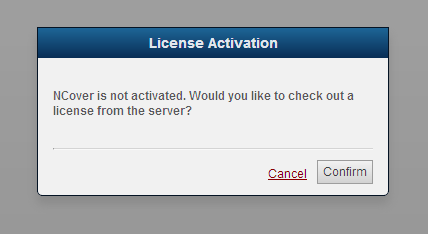 After the license is released, if you come back to NCover again, you'll get a dialog like this one. Just click the Confirm button to check out another license and starting using NCover again. Many customers are using NCover as part of an automated process, so they would like to use a script to checkout a new license, or release a license back to the server. Simply use the command-line for "ncover lic-request" to request a license as shown below. If you have both floating and standard licenses available on the same server, then you'll need to specify the --floating option to be sure you request a floating license. Similarly, if you wish to release the license back to the server, use the "ncover lic-release" command. Please contact us if you have any questions about floating licenses.